Spring rolls are a favorite in our home, and we eat them throughout the year. Loaded with vegetables and herbs, they taste fresh and have a light feel. 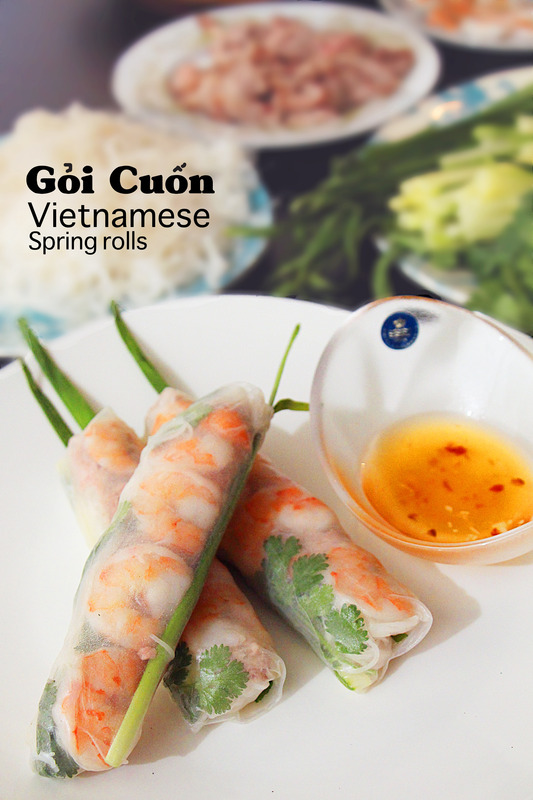 This classic Vietnamese spring roll recipe is made with boiled thinly-sliced pork and boiled shrimp. Depending on region, spring rolls are served with a side of either hoisin sauce or nuoc mam cham, a Vietnamese dipping sauce made with a fish sauce base (click for recipe). If you are having people over for dinner, two spring rolls per person are the perfect number for a light appetizer to impress your friends. You can also serve them as a main dish, but you need a lot more spring rolls per person – we usually just put the ingredients out and let people make their own. Vietnamese people like to share many small dishes with each other, and spring rolls are just one of many delicious options. 1. 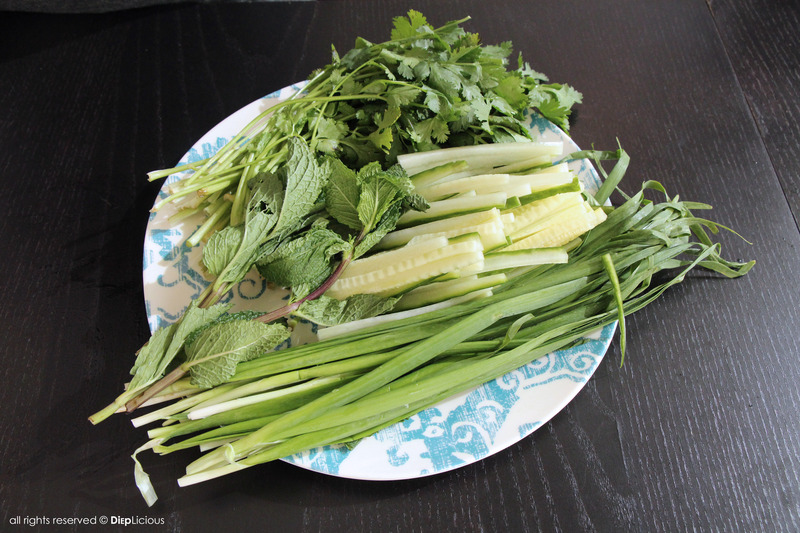 Prepare the Nuoc mam cham (see recipe under another post, or skip this step if you prefer to serve it with hoisin sauce). 2. Remove the shell from the shrimp and then clean and devein. Boil water in a pot with a teaspoon of salt and cook the shrimp until just cooked (do not discard the water). Be careful to not overcook the shrimp, as they will shrink and become tasteless. 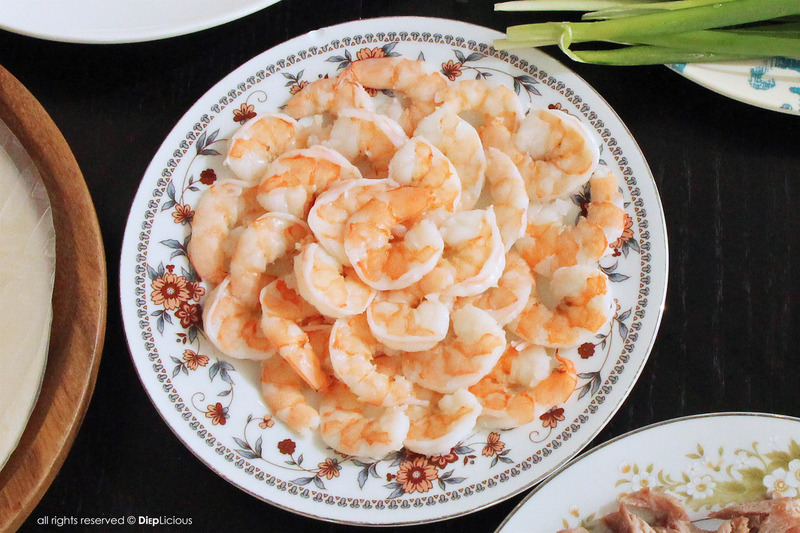 Let the shrimp cool off and cut them in half lengthwise along the back. 3. Boil the pork in the same water as the shrimp for about 10-15 min or until cooked through. Let the pork cool off, and then cut the meat as thin as you can. 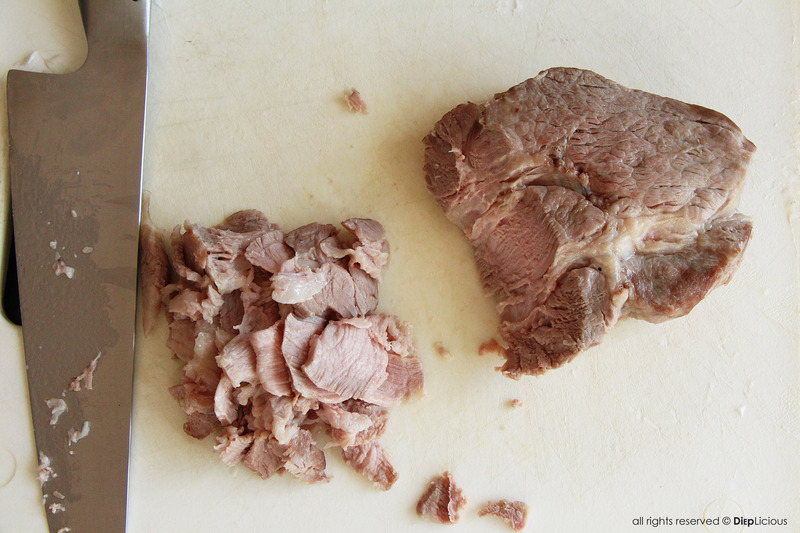 If you cut the meat at a slight angle, each piece will be a bit bigger. 4. In another pot, boil water and add 1 tablespoon of vinegar. Add the rice vermicelli noodles, and then separate the noodles while cooking using chopsticks or forks until the noodles are cooked to al dente. Strain the water from the noodles. Add a drop of sesame oil to prevent the noodles from sticking together, and then let them cool off. 5. Clean and prepare the vegetables and arrange them on a large plate. Assemble the spring rolls one at a time by dipping the rice paper for a few seconds in a bowl of water. Make sure that all sides are wet before laying it out on a plate. 6. 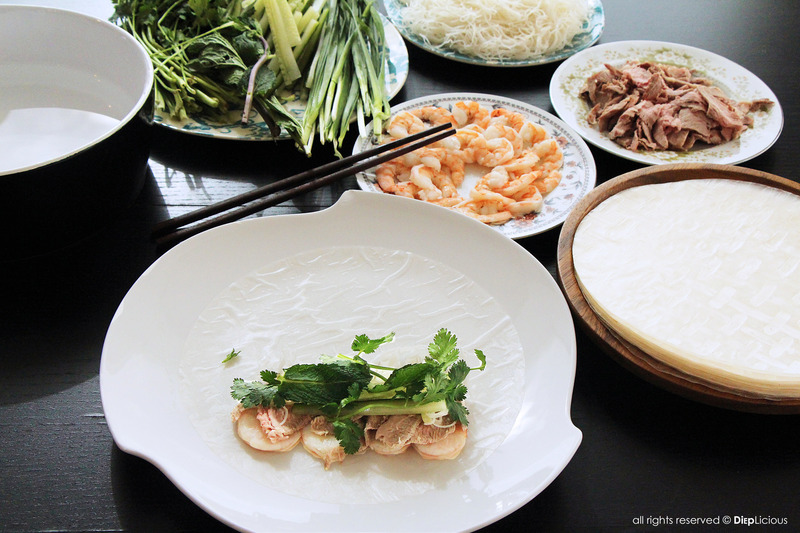 Add 4 pieces of shrimp with the pink side down onto the rice paper at the end of the wrap closest to you, and then add the meat, noodles, cucumber, cilantro and mint. Roll the spring roll halfway and fold in the sides, and then continue rolling it almost to the end and insert the 7. Chinese chives so that the ends stick out. Finish rolling the rest of the way until you can have a finished roll with the shrimp beautifully aligned. Continue with the rest of the spring rolls until you have made them all. 7. Serve two spring rolls and a little bowl of nuoc mam cham (or hoisin sauce) sprinkled with chopped peanuts for each person.